Many people enjoy lima beans, but they don't realize how many ways they can prepare them. Having a few good recipes in your back pocket can help you put this healthy and delicious ingredient to good use. 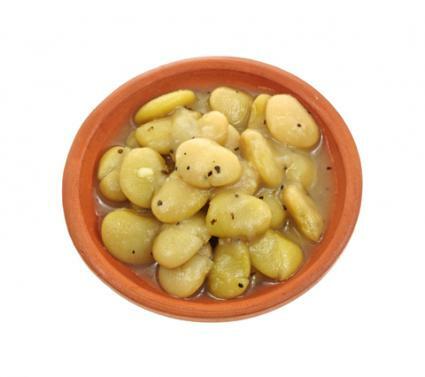 This is a basic method for cooking dried lima beans for use in other recipes such as soups or salads. 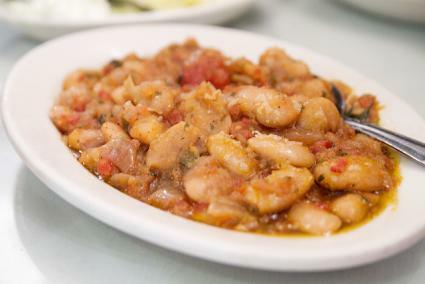 Since lima beans take so long to soften, it's best to cook them before adding them to other dishes. Soak the beans overnight in about one quart of cold water. Place the beans in a large pot, cover them with water, and cook on high heat. Bring the beans to a boil. Lower the temperature to medium and cover. Simmer until tender. This will take about 1 hour for baby lima beans or about 1½ hours for large beans. Replenish the water as needed. Add the salt about ½ hour before the beans are cooked. Add the butter and pepper, and stir gently to distribute through the beans. When the beans are fork tender, remove the pan from the stove and drain the beans. 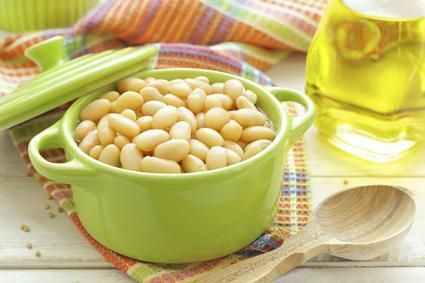 If you plan to use the beans for a recipe later, or in a cool dish such as bean salad, place them in a bowl of ice water to stop them from cooking. This recipe uses dried lima beans. Since the beans need to soak overnight, you'll need to start the recipe the day before you plan to serve it. The evening before you plan to serve your lima beans, place them in a bowl, cover them with water, and let them soak overnight. Drain and rinse the beans. Place them in a large pot and cover with water. 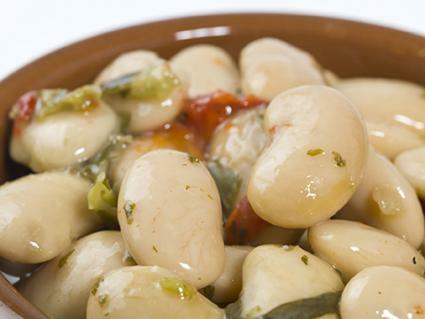 Bring the beans to a boil and cook them until tender, about 1 hour for baby lima beans or 1½ hours for large lima beans. While the beans boil, preheat your oven to 350 degrees. When the beans are fork tender, drain them and place them in a medium-sized, oven-proof casserole. Add the butter, milk and salt. Bake for 1 to1½ hours. This recipe flavors the beans with salt pork as they boil, and then transfers to the oven for a long, slow bake to meld the flavors. Soak the beans the night before you plan to serve them. The night before you plan to cook the beans, place them in a large bowl, cover them with water, and soak them overnight. Score the salt pork with a knife. Place it in a large cooking pot with the beans. Add water to just cover the beans and pork. Bring to a boil over medium heat. Boil the beans and pork for 30 minutes. Remove the pot from the heat. If the pork didn't break up on its own, shred it with a fork. Place the onion, jalapeno, and green pepper in a food processor and pulse for 1 second a total of 10 times to combine well. Stir the chopped ingredients into the pot with the beans, pork, and water. Add the molasses, ketchup, mustard, vinegar, and brown sugar. Place the mix in a large casserole. Bake, uncovered, for three to four hours until the beans are fork tender. This salad is best served at room temperature or slightly chilled. In a medium-sized bowl, whisk together the salt, chili pepper, onion, parsley, olive oil, and vinegar. Pour the vinaigrette over the beans and mix well. You can let this salad stand a few hours to let the flavors combine, or you can serve it immediately. This is a classic lima bean recipe made from lima beans and corn. For best results, use fresh corn. Heat two tablespoons of butter over medium high heat in a saucepan until it's melted and bubbling. Add the onion and red pepper, and cook about five minutes until soft,. Add the lima beans, corn, and water. Cook at a simmer for three minutes. Add the remaining two tablespoons of butter, salt, and pepper. 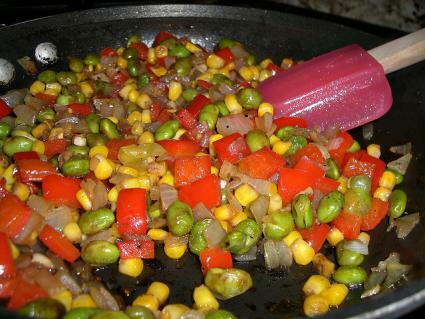 While cooking lima beans is time consuming, it isn't difficult to make delicious dishes with them. Use these recipes just as they are, or let them serve as inspiration for your own lima bean dishes.